If you’re looking for a commuting bike with the occasional weekend recreational riding, a hybrid bike is a perfect answer. Hybrids are ideal for anyone needing dependable transportation yet can handle a variety of terrains. The hybrid bike is a smooth blending of the top characteristics of the standard road bike and a mountain bike. These blended cycles are comfortable and easy to maintain and fast enough for riding the streets and bicycle paths. If you hear anyone talking about city-bikes and hybrids, you might wonder what they are and why you need one. In this review of the top ten hybrid bikes, we help you understand what they are and how they work. To choose the best hybrid bike for you, consider aspects like suspension, gears, wheel size, brakes, and your intended use. Once you find a bike you like, consider what type of riding you’ll be doing; commuting in the city, riding smooth streets, or riding rough terrains. What Should I Know Before Buying a Hybrid Bike? 1 What Should I Know Before Buying a Hybrid Bike? 17.0.1 There are five basic handlebar styles you can use on hybrid bikes. What makes a hybrid bike really good or just mediocre? Well, hybrid bikes have the features of both road and mountain bikes, and are made to operate with various terrains. They often have flat handlebars that help you ride in an upright position. Also, the tires are often thicker which helps with riding comfort on bumpy roads or trails. Most hybrid bikes have an aluminum frame, but steel and carbon fiber is also an option. Aluminum frames are light, affordable, and relatively strong. It may however sometimes feel harsh on rough roads, but newer designs are better have better shock absorption. Steel frames are heavier than aluminum, but also stronger and make the ride comfortable. Finally, carbon fiber frames are lighter than aluminum, and even stronger than steel frames, but the most expensive option. That’s why it’s used in high-end hybrid bikes. Some bikes have only select parts made out of carbon fiber to keep the cost down, but still make them strong. Such parts include the forks and seat posts. As far as wheel size, 700c is the standard for most hybrid bikes. However, this shouldn’t be something to focus on. When choosing a hybrid bike, pay more attention to your riding needs and style. Tommaso La Forma is a top hybrid bike that delivers the best overall hybrid performance and costs less than $1,000. La Forma comes in at a great price and has top features with outstanding durability for a superior performance experience. A brand that’s been around for many years, Tommaso has a history of making stylish and durable hybrid bikes. According to biking enthusiasts, the La Forma is Tommaso’s best bike with its lightweight, durable build, and lifetime warranty. Whether you’re a beginner or experienced biker, you’ll appreciate La Forma’s outstanding biking performance. The Tommaso La Forma Hybrid Bike delivers a high-quality experience over all terrains. 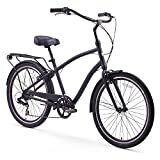 This bike gets top ratings because it’s a good overall bike that’s durable and stylish with great stability. So what features does the Tommaso La Forma have that sets it above the rest of the hybrid bikes on the market? Let’s take a closer look at exactly what makes the La Forma one of the best-specialized hybrid bikes. The most important features of any hybrid bike are the drivetrain, frame, and speed. Tommaso packed all these high-quality features in a lightweight and compact aluminum frame. La Forma’s HCT carbon fork suspension and the compact frame help dampen vibrations from road bumps along the way. The upright design and flat handlebars provide added comfort making your daily commute and riding experiences more enjoyable. Added traction and stability come from the La Forma’s extra wide tires. The versatility of a wider tread makes this hybrid a great choice for commuting or long recreational rides. The gear combination of an 11/32T and 48/36/26T crankset means quick tracking for a smooth ride on any road condition. A 27-speed full Shimano drivetrain takes you up and down hills or flying over flat roads. You never need to worry about having an extra gear when the terrain gets a little rough. With 27 gears you always have another one to slide into without losing your pedaling stride. As we mentioned earlier, the La Forma gets added comfort from its upright design and flat style handlebars. Also, the aluminum frame not only makes the bike lightweight, but it dampens road vibrations for added rider comfort. The highly rated, WTB brand seat adds extra comfort to your ride, whether commuting or pleasure riding. This seat by a well-known comfort brand in the biking world, shows Tommaso makes comfort a top priority. A possible downside of the Tommaso La Forma is it doesn’t come fully assembled. There are a few adjustments you need to make before the bike is road ready. First, before you take a test ride, the wheels and derailleurs need tuning. Finally, before jumping on, you must tighten all bolts to the included technical specifications. Making these adjustments before riding ensures your safety while giving you the bike’s top performance. If you prefer someone else do the assembly, any local bike shop can do it for you. Even if you do assemble the bike, it’s always a good idea to have an inspection done on it. A professional inspection ensures you have the safest ride possible. All the reasons mentioned above make it the best hybrid bike for the money choice. For a bike that lets you commute yet go off road on dirt or gravel, a hybrid is the answer. The Marin San Rafael DS3 LE does almost everything except going backwoods mountain riding. The DS3 LE has the speed for pavement riding with multi-terrain tires and front suspension for off road. Whether you adventure across town or through the backwoods, the Rafael DS3 has a build for getting you there. A lightweight Marin Series 3 aluminum frame serves as the base for this Dual Sport hybrid with upright geometric design. The Dual Sport geometry offers comfort and stable handling no matter what terrain you’re traveling. The shock of uneven surfaces gets absorbed by the Suntour NEX fork and hydraulic lockout while giving fast pavement riding. Rounding out the features is a powerful Shimano hydraulic braking system for keeping your bike under control in all conditions. An Alivio 27-speed drivetrain keeps you pedaling with smooth shifting and a wide enough gear range for any terrain. Other features include a full rack for carrying cargo and fender mounts for adding a variety of customizing accessories. With this bike, no special shoes are required. As it has platform pedals, it can accommodate any type shoe. Finally, this bike offers an upright riding position and a suspension fork that can smooth out bumps on rough pathways or roads. When you’re looking for the best hybrid bike under $500, the Vilano Diverse 3.0 is one of the best available. The ability to use the Diverse 3.0 as a commuter bike and an off-road bike, makes it highly desirable. For a beginner, the under $500 cost is an added benefit when you’re just starting out with a hybrid bike. We wanted to test this bike out, so we rode it for just a little over 5 miles and found zero issues with it. For safe measures, when your bike arrives you may want to take it to a local shop and have the gears and brakes tuned. More than just another bike for the collection, the Diverse 3.0 carters to the different styles and needs of cyclists. Starting the long list of features is disc brakes for more cycling control. If you need quick action and sudden braking, the 3.0 brakes deliver. The 24-speed hybrid features a lightweight 6061-aluminum frame, which absorbs shock and gives the bike a sturdy build. For added riding comfort, the Diverse 3.0 has platform pedals and bent back handlebars. The flat handlebar promotes an upright riding position for reduced upper body strain. Powertrain components are Shimano Tourney, except for the turntable and crank arm. Take on all roads with Kenda 700c tires and front and rear Shimano Tourney derailleurs and shifter. The Diverse 3.0 arrives at your door partially assembled. Handlebars, pedals, and saddle need to be attached, and the stem needs flipped. The brakes, derailleurs, and wheels need tuning, either by you or a professional. While tuning isn’t difficult for seasoned riders, a newbie might find it too complicated. This bike is not ideal for trails. It is, however, ideal for roads and paved trails. It takes an average of two hours to assemble if you have experienced with assembling bikes, possibly three if you don’t. For added comfort, consider adding grips to the handle bars. 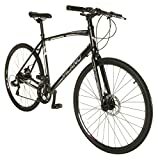 For less than $300, Schwinn delivers a comfortable and well-outfitted hybrid bike, the Discover Men’s Hybrid. While it may not be flashy like other high-end hybrid bikes, it does deliver a practical commuting bike. This low-priced hybrid is a powerhouse, outfitted with aluminum framing, making it perfect for city riding. The aluminum construction stands up to the average city rider without structural integrity concerns. Add the SR Suntour suspension fork, and the bike has easy navigation both in the city and on the trail. However, with this solid frame comes the bike’s overall weight. Coming in at a hefty 46 pounds without attached gear, this is a heavy bike. While aluminum is lightweight, to add sturdiness the frame is thicker for dealing with weak integrity. This thicker framework adds to the overall weightiness and rigidity of the Discover Hybrid Bike. This stable framework has a design for larger riders, over 5-feet 9-inches tall. Any shorter than this and you need to find a smaller and lighter ride. On the brighter side, the riser handlebar has easy grip shifters operating a Shimano gear set with 21 speeds. You get easy control without ever having to remove your hands from the handlebar. Just a twist of the wrist, backward or forward, and you easily move through the gears. The Schwinn Discover has rear fenders and a wheel rack, perfect for hauling boxes or adding traction in wet terrain. As far as the setup goes, you may have to make some adjustments to make it ride the way you like. The only compliant we have is the the pedals are not as strong as we expected and are prone to breaking. While the Schwinn Discover Men’s Hybrid may not have the sleek styling of a road bike, it does have functionality. With a price under $300, you have a sturdy piece of equipment that takes you where you need to go. With smooth shifting and a sturdy frame, this is by far one of the best hybrid bikes on the market. At less than $500, the sixthreezero EVRYjourney Womens Hybrid has the speed, comfort, style, and quality women love. While the EVRYjourney is relatively inexpensive for a hybrid bike, it’s quality is top notch. Whether commuting or trail riding, you get outstanding features for every dime you put out for this great women’s cruiser. The EVRYjourney accommodates everyone from younger riders to adults. The strong aluminum build frame lets this bike take riders from five feet to six feet, four inches tall. Shimano 7-speed internal hub allows the rider a wide range of riding terrains including city, commuting, and hilly rides. As the terrain becomes difficult, you can easily change your pedaling intensity to handle the ride efficiently. The front and rear hand breaks give the rider precise and easy stopping for quick response in cases of emergency. EVRYjourney’s proprietary Smooth Cruise Configuration makes pedaling smooth and effortless. This configuration delivers torque and power for hill climbing and speed. When it comes to comfort, the EVRYjourney has you covered with an extra wide cruiser-style seat. Covered in synthetic leather, the seat has highly padded foam and a design for minimizing jouncing and bumping. This 7-speed cruising bike has sweeping handlebars for keeping your back in an upright position. Your shoulders remain relaxed, and your head stays up for keeping your posture ergonomically comfortable. A more comfortable leg extension comes while riding and your feet stay flat on the ground when stopped. Aside from the thrilling experience you get riding the sixthreezero EVRYjourney, you can proudly show off your sense of style. The retro styling with four color choices and wide whitewall tires takes you on your journey with class. It is truly beautiful and will turn heads, mainly due to its cool finish. If you're into the old school design, this hybrid bike is perfect for you. It is also a great beach cruiser, if that's what you're looking for. The well-known brand, sixthreezero, has the perfect everyday hybrid cruiser, the EVRYjourney Men’s 26-Inch. The Shimano 7 speed internal hub makes this bike uniquely qualified for street use, trails, and uphill riding. The EVRYjourney has a weight capacity of 300 pounds and carries riders from five to six feet four inches tall. Designed specifically for men, the EVRYjourney has a mechanical configuration and standard 19-inch aluminum, low swooping frame. The EVRYjourney has great features making it perfect for any riding situation including rain, fog, urban riding or trail riding. Sixthreezero claims their exclusive engineering allows forward pedaling giving the rider a low gravity center. The low gravity center keeps the rider’s back in the upright position with proper leg extension for ergonomically correct riding. After coming to a full stop, the ability to stand over the seat makes mounting and dismounting easy. For added safety, sixthreezero added front and rear handbrakes for quick and secure stopping. Smooth and easy pedaling comes from the EVRYjourney’s Shimano 7-speed hub and Smooth Cruise Configuration. These combined features provide the torque needed for hilly or fast rides and a twist shifter delivers easy changing gears. The EVRYjourney has a distinctive look that stands out with vivid frame color, fenders and rear rack, and retro styling. Sweeping handlebars combine cruiser curves and hybrid function. The extra-wide, height adjustable, cushioned dual spring saddle seat and hand grips add to the overall look. With this attention to detail, the EVRYjourney is an aesthetically well-designed bike. While you may not think of this brand when examining the best hybrid bikes, the manufacturer has made improvements that compete with leading brands like Mongoose and Schwinn. The only thing we could caution you to watch is the paint. It can scratch rather easily if you don't take care of it. Other than that, this bike is quite sturdy as its got some weight to it. It is easy to ride and to get on and off of it. When you want a sport hybrid bike, Diamondback Bicycles has one of the best, the Insight 2 Complete Hybrid Bike. The 21-speed Insight 2, built for speed and comfort, gets its uniqueness from quality construction at an affordable price. The lightweight aluminum alloy frame is double-butted for added strength. Precision handling comes from the aluminum alloy build and makes this hybrid stand out above the competition. Diamondback added a stylish, sleek design to the quality build making this hybrid competitive against the higher end models. The build and quality Shimano components give fun and versatile family recreational rides or trouble-free daily commute. Shimano parts mean fast and reliable gear changes regardless of the terrain you’re on. Even though this hybrid is best for touring or racing, you still get the possibility of an occasional trail ride. The Diamondback Insight 2 has enough versatility to keep your cycling outings interesting. A 6061-T6 Aluminum Performance Hybrid Frame, integrated head tube, and alloy aero straight blade fork deliver vertical stance and precision. For comfort, a DB Performance Hybrid saddle gives you a good ride minus the common muscle strain and fatigue. Resistant, low rolling 700c wheels means swift and effortless rides with proportional stability. A Shimano gear system with 8-speed shifters, high-quality cranks, brake levers, and derailleurs are features found on more expensive models. The quality of this lower cost hybrid bike gives you the confidence that you made the right choice. Assembly is relatively easy with this bike, as you won't have to make any modifications or adjustments, unless you want to upgrade certain parts. The only part we didn't absolutely love about this hybrid bike is its braking system. The disk brakes seem to under-perform when compared to other top rated hybrids. During one of our tests, we found it harder than it should be to brake. To be sure, we swapped the brakes that came with this bike with another leading brand, and found that the bike performed well overall. While it is not entirely necessary to change the brakes if you'll be riding locally, if you are someone who rides several miles per week, you might want to consider it. For meeting the heavy demands of commuters, the Mongoose Reform Dual Sport takes center stage. This versatile hybrid bicycle not only handles everyday work commutes but takes on fitness regimes and off-road adventure with equal finesse. If you’re looking for a strong, durable dual-sport hybrid, then the Mongoose Reform is your bike. It has a light and robust frame which allows you to ride more smoothly. The best hybrid bikes should be durable, and Mongoose only uses the best materials. The Mongoose Dual Sport has an aluminum frame and SR Suntour NSV suspension fork for a responsive and smooth ride. An Altus 21-speed drivetrain with Altus shifters gives you consistent performance with a wide gear range. Front and rear hydraulic brakes give reliable stopping regardless what weather or terrain you find yourself. Your ride remains smooth and safe. This bike is also equipped with with Kenda Happy Medium 60 TPI, which makes it suitable for even the roughest of riding conditions. Meaning, if you're riding a slippery terrain, this special grip should make it easier. Wider than normal commuter tires handle gravel and rough roads while the suspension fork absorbs vibrations. The 29-inch tubeless-ready rims mean less added weight to the overall bike weight while adding speed to your ride. When it comes to multifunctional versatility bikes, the Raleigh Bikes Redux 2 Urban Assault is one of the best available. The Urban Assault has outstanding features and varied condition riding abilities that make it stand out above the rest. Superior quality makes Raleigh Bikes some of the best in the biking industry and the Urban Assault is no exception. Whether city commuting or taking it off the road, the Assault easily handles any obstacle with outstanding style and superior quality. The Redux 2 Urban Assault has nine speeds. When city commuting, this variety of speeds makes the Redux faster than the leading commute models available on the market. The Assault features a lightweight, 26-pound aluminum alloy frame with an integrated Urban Assault geometry fork design. The geometry design lets you stay riding upright while keeping you focused on the road. Your ride is comfortable and easy. Topping the safety features of the Redux 2 is its hydraulic disc brakes for extraordinary braking power in all conditions. Even in wet conditions, the braking power performs well. With the three different size choices, you can find a Redux to fit most riders. Size small fits riders from 5-feet 3-inches to 5-feet 6-inches tall. Medium fits people 5-feet 6-inches to 5-feet 9-inches and large fits anyone 6-feet to 6-feet 4-inches tall. Regardless of your height, you can find the perfect size Redux 2. The biggest downside to the Redux 2 is it only comes partially assembled. If you don’t have bike assembly experience or are uncomfortable with assembling, you’ll need a professional’s help. Most riders agree the Redux 2 has superior performance and durability with amazing power. Another Raleigh on our top 10 best hybrid bike list is the Raleigh Cadent 1 Urban Fitness Bike. The Cadent 1 provides stellar comfort and performance in the best entry-level hybrid that performs like a professional bike. When it comes to comfort, Cadent delivers with flat handlebars, and sporty geometry keeping you sitting up straight. The upright positioning means the spine is ergonomically aligned, reducing the stress to the lower back and keeping you comfortable. The Cadent 1 frame, weighing only 26 pounds, is lightweight yet well-built and durable. Fender and rack mounts transport gear when needed. The 700c, double wall tires and wheels keep your ride efficient and quick. The smooth shifting, 21 gears and a Shimano drivetrain keep you rolling along effortlessly over flat ground or hilly terrain. Easy to maintain mechanical disc brakes provide quick performance with safe stopping under all road conditions. A Selle Royal Shadow seat comes standard on the Cadent 1 and is comfortable for commuting and general pavement riding. However, if taking long rides or going off-road, you might consider upgrading the seat for better comfort. 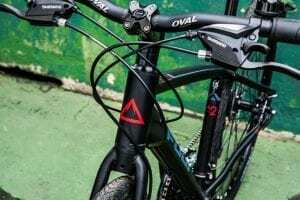 While it is not at the top of the list of the best hybrid bikes, it is a solid and affordable option from a reliable brand. The Raleigh Cadent 1 comes partially assembled and requires the rider to complete the assembly. While assembly is relatively easy, the brakes are more difficult to put together and may require a professional. But once you get the brakes on, your bike has excellent stopping ability with great control. A mixture of cruising, mountain, and road bike designs, the hybrid bike has features creating a do-it-all bike. But, with all the different features finding the right type of hybrid bike mainly depends on how you use it. Where will you ride the bike? City streets, bike trails, off the road, a mix of gravel and pavement? Will you need to lock up your bike on the street? Is affordability or the highest quality bike more important? How much can you spend on a hybrid bike? Do you prefer high-tech over practical and simple designs? Once you’ve answered these questions, it time to decide what types of features and components you want. It’s important you find a bike that’s right for you and fits you and your needs properly. To figure out the hybrid features you need, you need to answer the question of where you plan to ride. City commuting, bike paths, working out or cruising, or a mixture of two or more which requires different features. Once you know the riding purposes, you can begin choosing the features best suited to those purposes. Gears are perhaps one of the key factors in matching your riding purpose to the hybrid bike features. Available from one to 27 or more, gears directly affect the considerations of fitness level and riding terrains. Riding a hilly course where you’re constantly climbing takes more gears than a flatter city commute. If you’re a strong cyclist or you only ride flat terrains, you can get by with fewer gears. Anywhere from one to seven gears should get you where you need to go. Some hybrid bikes come with just one gear speed. The rear hub of these single speed bikes has a freewheel mechanism for coasting just like a multi-gear bike. If you don’t plan to do a lot of hilly riding, a single gear is a way to go. Many hybrids do not have any suspension at all. Pedaling becomes less efficient by the weight of the suspension fork, and those riding smooth surfaces forego the suspension. Other hybrid bikes, like urban bikes, include front suspension forks. The forks help with impact absorption on the front wheel, smoothing out the ride on rougher streets and paths. If your bike is equipped with cheap suspension, though, expect it to bob a lot when you're climbing hills. You can even lock out which is dangerous. The best hybrid bikes with proper suspension are ideal for commuting and even bike touring. Since the bikes we reviewed are dual purpose, they all have a suspension fork. Many riders agree that having suspension just makes your ride that much smoother and more comfortable. Many top-rated hybrid bikes have rim brakes, which feature braking pads that grip the wheel rims. 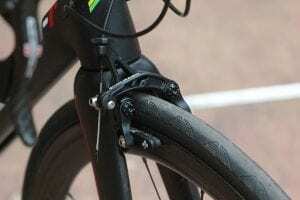 There are advantages and disadvantages to this type of brake. Disc brakes have brake pads that grip a rotor mounted on the wheel hub. Such brakes also come in two versions. Hydraulic disc brakes for a stronger more progressive breaking with less finger effort. These disc brakes are self-adjusting for brake pad wear. Mechanical disc brakes have manual adjustment when the pads begin to wear. When buying one of the best hybrid bikes, the next features to consider are handlebar and seat levels. Most hybrid bikes have a seat lower than the handlebars. The lower the seat is below the handlebars, the more comfortable you are when riding the bike. When seats are higher than the handlebars, you have a more aerodynamic riding position. While this seat height gives more power for faster pedaling, it's not as comfortable. There are five basic handlebar styles you can use on hybrid bikes. Drop-Bar – Mainly found on road bikes, the drop-bar is an aerodynamic, lightweight handlebar. If you plan to use your hybrid for speed, these are the preferred handlebars for going fast. 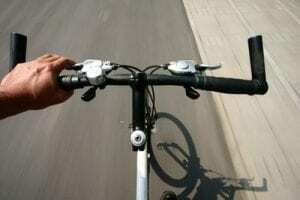 Flat-Bar – The most common handlebars on hybrid bikes, the flat-bar is heavier than the drop-bar. However, unlike the drop-bar, the flat-bar lets you sit straight up, in a relaxed position, for a better road view. The upright riding position helps reduce back, shoulder, hand, and wrist strain. Riser-Bar – Another common handlebar on hybrid bikes, the riser-bar has a shape that extends up and back toward the rider. The riser-bar lets you sit farther back and straight up for good road vision and better steering control. Mustache-Bar – Similar looking to a drop-bar, the mustache-bar has very little drop in its shape. The mustache gives you a better upright position than the drop-bar and a variety of hand positions. Moustache-bars are found on both hybrid and road bikes. Most bikes, regardless the style, are made from aluminum. However, steel and carbon fiber frequently find their way into the makeup of hybrid bikes. Each material is easily attainable in a bike frame, and each has their pros and cons. It’s important you carefully consider your needs before deciding on a frame material. Surprisingly enough, hybrid bike frames can bend over time, especially if you bought a used bike or if you hit something with your bike. If this happens, consider fixing your bent frame before going to buy a new bike. Aluminum is the lightest of the three materials, It’s also stiff, durable, and the most affordable. Some riders describe aluminum as feeling harsh when riding on rough roads. However, the newer construction technologies make the shock absorption better than in the past. Steel is considerably heavier than aluminum. However, the strength and flexibility of steel give hybrid bikes a smoother ride. Of the three materials, carbon fiber is the lightest, yet it’s stronger than steel. However, because carbon fiber is the most expensive, it’s the most popular choice for higher-end bikes. Some bikes only use carbon fiber seat posts and forks instead of making the entire frame out of it. A partial composition of carbon fiber provides some of the material’s benefits while keeping the price down. Q: Is a hybrid bike good for long distance? A: Distance is not as much of an issue as some may think. Sure, it is much easier to cycle long distances on road bikes, but if you are a true cyclist with a high fitness level, you can travel as much as 85km in just one day. The only real issue is with the handlebars, as they are flat and you will only have a single hand position. You may want to consider getting ergonomic grips, for better hand positioning and comfort. You may also want to consider upgrading the seat and tires (high pressure is best). Q: Are hybrid bikes good for trails? A: Hybrid bikes can certainly be ridden on trails, whether paved or unpaved. However, they are not ideal at all for mountain bike trails, which are often considered as rough off-road trails. 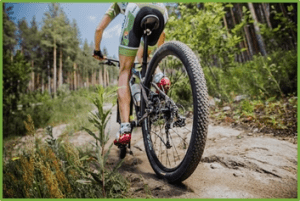 Hybrid bikes normally have medium-width tires with a relatively smooth tread, which allows for a perfectly smooth ride on pavement and unpaved trails alike. This is because such tires have enough cushion and grip. Q: How are hybrid bikes like mountain bikes? A: Simply put, hybrid bikes can be good for trails that are relatively easy, but wouldn't be the best pick for rough terrains. Mountain bikes are much more suitable for rugged terrains and off-road adventures. This is because mountain bikes have flat handlebars for greater steering control. They have wider and larger tires that have shock absorption. Overall, mountain bikes weigh more than even road bikes, but are the best choice for off-road. Regardless of which hybrid bike you decide to buy, make sure it’s the fit that’s right for you. Bikes come in a variety of different frame sizes so always look at the manufacturer’s sizing charts. These charts list the height range recommendations for each hybrid bike model and size. Determine your riding goals before buying. The bike should match the riding style you plan for it whether you need a cruiser, a commuting bike, or an all-terrain bike. Depending on the areas you ride, you need to choose a bike fit for the paths you take. If you do long off-road or trail rides, then comfort is the key. Comfort features don’t figure as heavily when you need a standard commuting bike for shorter less jostling rides. If you plan to transport your bike a lot, you need one that’s easy to take with you. Lightweight with easy to remove front wheels makes transporting simpler. Compare the gears to your planned riding. If you only commute, then 1 to 7 gears are enough. But, if you plan on a lot of hills and trail riding, then you need a lot of gears from 24 to 27. Pick the size that’s right for you. Look at the manufacturer’s sizing chart before buying. To sum it up, we believe the Tommaso La Forma is the best hybrid bike for the money and a good bargain for less than $1000. It is also quite ideal for men and experienced riders. If you are looking for an option under $500, consider buying the Vilano Diverse 3.0 Performance bike. If you are looking for a hybrid bike for women that's also a cruiser, look at the sixthreezero EVRYjourney bike, which is highly rated and is packed with lots of features. Finally, if you want to get good exercise with your bike, try out the Diamondback Bicycles Insight 2, which is perfect for sports enthusiasts and performance. What's your favorite hybrid bike? Share with us in the comments! 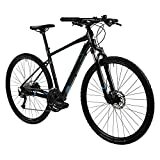 I am struggling how to classify a normal bike from a hybrid one. Is a hybrid meant different manufacturers for each component? Or it is different from the norm? Is it good for triathlon? I was trying to see whether that sport is for me. So I was thinking about hybrid bikes. Marin San Rafael DS3 LE Sport seemed like the best option for me. It’s quite affordable, with a good aluminum frame, which is great to make the bike easier and faster to ride. Thanks for this review. I like it that you include some pros and cons of the item. 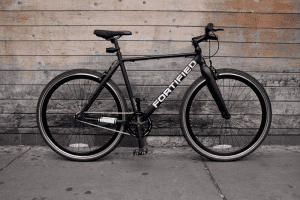 I tend to choose the hybrid bike you recommended – the Tommaso la Forma. I would not have the pleasure of doing the assembly myself though. The price too is affordable. thanks for the heads up..I have always wanted to own a bike sure enough for now i know which on to go for. I’ve been researching for the past couple of months and I’m glad I found this page! Very informative. That Marin San Rafael DS3 LE Sport looks like a sweet ride! Unfortunately it’s just out of my budget right now. Should I wait and save up a bit more for it or just jump the gun with the Vilano Diverse 3.0? The sixthreezero EVRYjourney Womens Hybrid looks very cute. I would love to get one myself. Awesome review of hybrid bikes! Thanks! I really like the Vilano Diverse 3.0. For under $300 this is a great deal. I really like the fact that it has 24 speeds!! 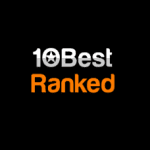 sixthreezero seems perfect for me! & the schwwin sound awesome!